Pamper yourself with onsite massages or enjoy recreation amenities such as an outdoor pool. Additional amenities at this hotel include complimentary wireless Internet access, concierge services, and babysitting/childcare (surcharge). Guests can catch a ride to nearby destinations on the area shuttle (surcharge). Featured amenities include complimentary wired Internet access, express check-in, and express check-out. A roundtrip airport shuttle is complimentary (available 24 hours). Relax at the full-service spa, where you can enjoy massages, body treatments, and facials. You're sure to appreciate the recreational amenities, including an outdoor pool, a fitness center, and bicycles to rent. Additional amenities at this Art Deco hotel include complimentary wireless Internet access, concierge services, and babysitting/childcare (surcharge). Guests can catch a ride to nearby destinations on the complimentary area shuttle. Featured amenities include a business center, limo/town car service, and express check-in. A roundtrip airport shuttle is provided for a surcharge (available 24 hours), and limited parking is available onsite. Make yourself at home in one of the 43 air-conditioned rooms featuring minibars and flat-screen televisions. Rooms have private balconies or patios. Complimentary wireless Internet access keeps you connected, and cable programming is available for your entertainment. Private bathrooms with separate bathtubs and showers feature complimentary toiletries and hair dryers. 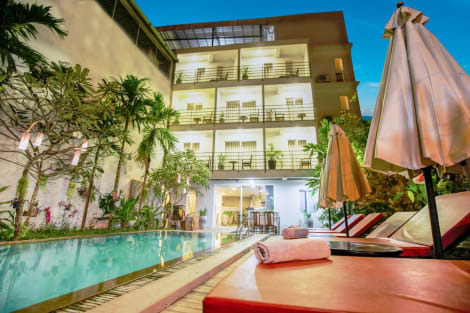 A stay at Grand Sunset Angkor Hotel places you in the heart of Siem Reap, within a 15-minute walk of Pub Street and Royal Garden. This 4-star hotel is 5.3 mi (8.5 km) from Angkor Wat and 0.8 mi (1.3 km) from Angkor Night Market.